Most of us love a quick trip to the mountains to breathe some fresh air, enjoy a change of scenery and partake of a different style of cooking. La Noria is so very close to Mazatlán (45 minute drive), and late last season I told you about one of the new restaurants there—La Vaca Lupe. Friends of friends own the place, so we’ve gone quite a few times. La Vaca Lupe is a typical campestre/rural-style restaurant, serving very good grilled meat, fresh cheese and salsas in a rustic, open-air environment. They do menudo on Sundays, and bake wonderful conchitas and other breads in a traditional wood-fired oven. Greg loves the meat, and I love the huge grounds of the property. The owners have put in trails so you can work off some of those calories post-meal. One of the trails goes up and around the hill and the views are really pretty. Vaca Lupe also has lots for kids to do: there’s a wonderful petting zoo, awesome rope swings, and bicycles. I recommend it. It’s on the left side of the highway as you go into La Noria, just past Los Osuna distillery. The second place we just tried this weekend—La Martina Sabor con Historia. It has been open for three months and is a similar campestre/country-style restaurant. This one, however, is less rustic and more hacienda-style. You enter a nice covered courtyard with a fountain surrounded by tables. Beyond that is a beautiful high-ceilinged, well-decorated room, and, finally, another terrace that overlooks the valley. Up the hill they’ve built a small chapel, so it’s all quite scenic. I had one of the best salads I’ve ever had, seriously. Greg wasn’t as impressed with his stuffed steak, but he did enjoy it. Total for two people at lunch? 295 pesos! Entrance to the restaurant is via the Los Osuna distillery driveway, just keep to the left instead of going into the distillery on the right. Both of these places are only open during daylight hours, around 9 to 5, and you have to bring your own beer or alcoholic drinks. La Noria is a wonderful little town with quite a few traditional artisans—cheese, leather, machetes, wooden barrels, pottery. Los Osuna distillery is there as is Huana Coa zip line. These two restaurant options make it even more of a draw for a terrific day trip. There are also a couple of balnearios or swimming pools in the area, if you would like that. These are the basic, rural Mexican variety and a lot of fun. The restaurant that’s been on the road for a long time—La Abuela Tina—is still there. It’s just past the entrance gate to town on the left. I am very excited that reporters from eight respected national publications will tour Mazatlán and southern Sinaloa from May 7-10, to learn about, report on, and photograph our regional artesanía and artesanos. The tour is coordinated by Turismo Mazatlán and Turismo Sinaloa, as well as by the Association of Hotels and Tourist Enterprises of Mazatlán. If you are regular readers of VidaMaz.com, you know that we are big proponents of culture, particularly the preservation of local, regional and indigenous traditions. We also support sustainable tourism, ecotourism, religious and cultural tourism. Thus, we are extremely happy to know that tourism officials are taking action to help promote “the little guy,” those who add so much to our communities by producing the gorgeous handiwork we enjoy. Most traditional handicraft is beautiful and also utilitarian. It reflects the culture, the environment, the people, and the daily life of the place where it is made. Preserving it, helping it thrive and develop, creates pathways out of poverty, builds healthy communities, and prevents delinquency and violence. Just look at the increased success, popularity and value of Native American handicrafts and music over our lifetimes, and the improvement in the quality of what is produced! We can create such a success story here in Mexico as well. Sinaloa is smart to diversify beyond heavy eco-footprint industries like cruise ships. Cultural tourism can help preserve our heritage and the gorgeous natural environment with which we are blessed, and it can help build strong, vital, resilient communities. It attracts a more savvy brand of tourist, one that is increasingly wealthier and more committed to the welfare of local communities. Kudos to all involved! Publications participating in the upcoming tour include my personal favorite, México Desconocido; the Reforma newspaper’s De Viaje supplement; the Destinos section of El Universal; Conceptos Turísticos magazine; Travelers Guide to México; Viaja Bonito magazine; Reportour 98.5 FM; and the magazine, Tiempo Libre. 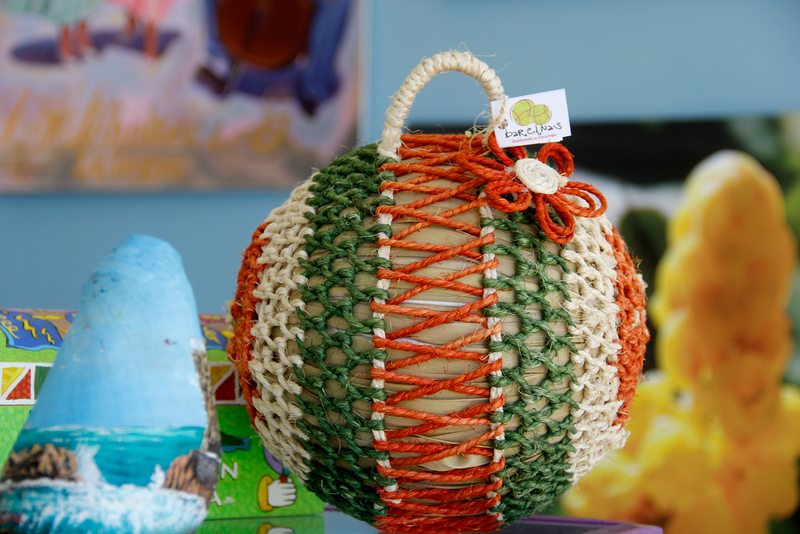 The museum at Seashell City, to view handcrafted items such as lamps, boxes, crosses, Christmas ornaments, and picture frames made of shells. Onilikan in the Golden Zone, to savor their fruit-flavored liqueurs and aguardiente, distilled in that gorgeous copper kiln. Suaves downtown, makers of the world’s best marshmallows, to meet María Clara and experience the process of creating our much-loved local pride, coconut-flavored marshmallows. I would like to politely suggest that the group visit a few of our terrific local seamstresses such as Sodelva Rios de Garcia, to showcase our long local tradition of sewing Carnavál costumes and royal dresses. They should also tour some of the terrific art and artisan galleries around town. And even though they won’t be active this time of year, I would recommend the official visit include the talleres/workshops for the carrozas or floats of Carnavál, or at least a slideshow presentation showcasing how important, inclusive and wonderful Carnavál is for our local community, and how many terrific artisans contribute to making it a success. Maybe another trip, so they can see monigotes or giant statues being created as well. La Noria, where they’ll tour the gorgeous, award-winning Los Osuna distillery as well as visit the leather makers. El Tablón Viejo in El Rosario, where they’ll learn about handicrafts made from gourds by the Larreta Medrano family. Escuinapa, where they’ll watch barcinas, as in the photo at the top of this post, being made. I would also suggest they visit Ernesto at Productos Rivera, so they can watch the wonders the crafty ladies there do with fresh and dried mango. Malpica, Concordia, where they’ll witness mosaic-making. El Rodeo, Cosalá, and the traditional method of making conserva de Papaya. The last time we visited El Rodeo, Saboreando Ando was visiting there as well. Click through to see photos and video of the making of the conserva. If you have not already visited the places above, or if it has been a while, now is a good time to go! The weather is perfect, national tourists have not yet arrived en masse, and local handicrafts-men and -women are eager to earn your patronage! We had a terrific time driving up to La Noria for a day trip. The adrenaline highlight was zip lining at Huana Coa. 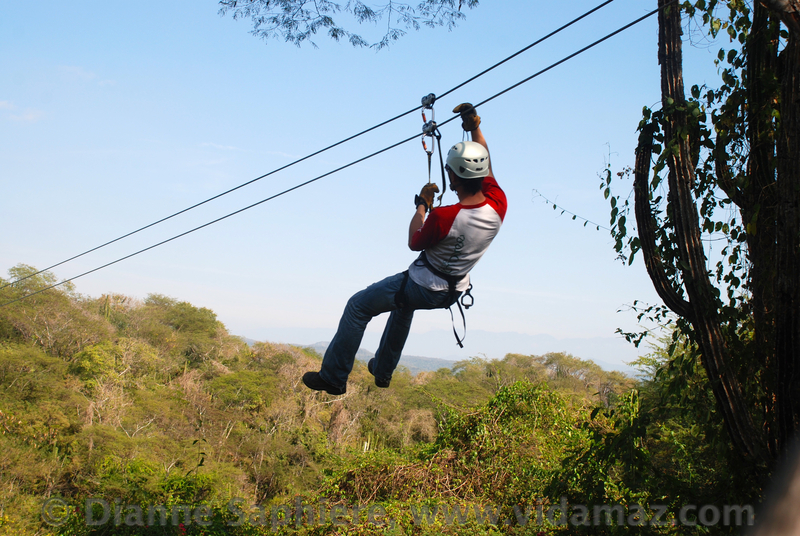 We are fortunate here in Mazatlán to have a couple of great options for zip lining, and this is one of them. 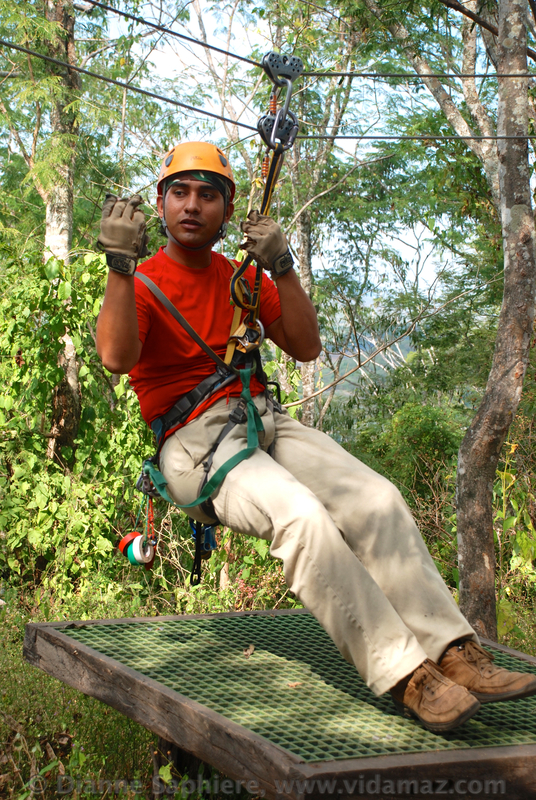 Have you ever zip lined? Remember what it feels like? If you haven’t, do you wonder what it’s like? Here’s video that I took while riding the line they call “Shotgun.” Surrounded by trees, it almost felt like I was carving my own tunnel. So very much fun! La Noria is about a 45 minute drive up into the Sierras. It is gorgeous up there: trees and mountains as far as the eye can see. Huana Coa was built six years ago. 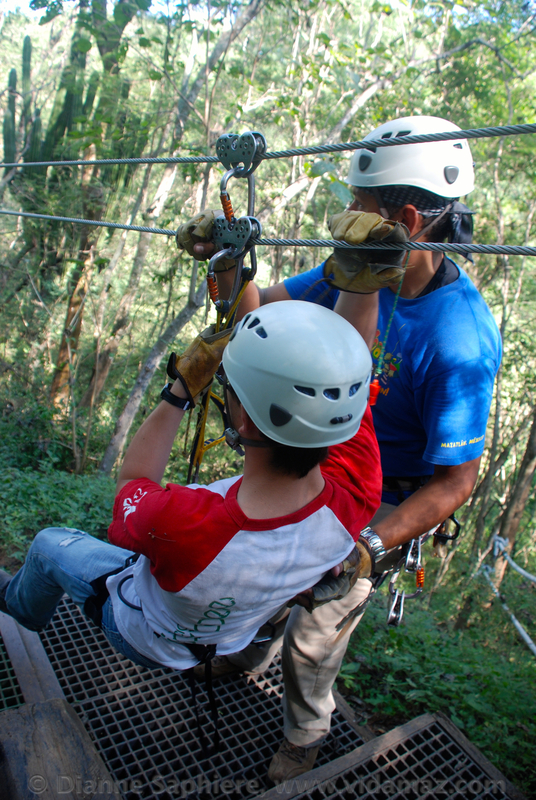 They have nine lines and twelve platforms, plus rappelling in addition to the zip lining. There is also four-wheeling and horseback riding up here, plus of course the gorgeous town of La Noria and the tequila distillery, Vinata Los Osuna, which I’ll write about separately later. The video below is what Greg took on an earlier line, a wide open one. It’ll give you an idea of the contrast among the nine lines here at Huana Coa. Their equipment is state of the art, mostly German-made Petzl. All equipment was very well maintained. Huana Coa uses two lines one above the other and double pulleys, so even should one fail or turn sideways, which is highly unlikely, you still have backup. There was not a second that I wondered about safety. The staff had us tied to a line every moment we were there, tying us off to a stationary line before unhooking our harness from the zip line. Below are two videos of our son, one of him leaving a platform, and one of him coming in. This is a terrific family activity. He had a blast. Though of course, he’s 17, so he’s too cool to show too much enthusiasm when he’s with his parents. Just in case you start thinking this is a young person activity, or one for thin people only, I’ll show some video of me coming in, whooping and hollering the whole way because it was just so much fun. They told us they’ve had 80+ year olds on the zip lines who fully enjoyed themselves. The lines themselves are fairly easy. Getting to the lines, however, requires an uphill climb, and there are stairs to several of the platforms. It does, therefore, require mobility. Johnathan, one of the staff, gave us safety instructions before we headed out, and again once we arrived at the first platform. All the staff were bilingual and amazingly helpful and fun loving. Staff members took time to help all of us suit up and get comfortable with our harnesses. 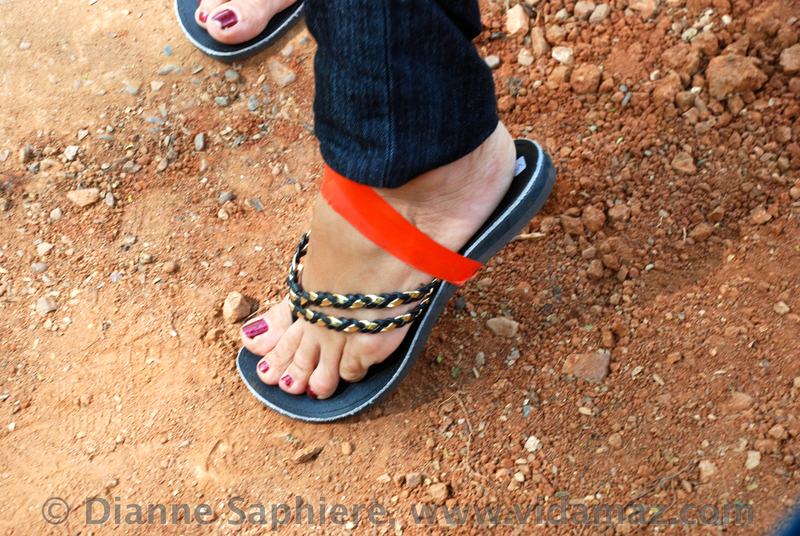 They were so kind that they even taped on a woman’s flip flops so she wouldn’t lose them while she was zip lining! All of the platforms were very well made, and while we were on them we were always securely tethered. Staff hook you up for each line, ask if you are ready to go, and then push you off when you are ready. It was soooooo, oh so much fun! I was quite taken with how the crew transported water for us from one station to another. Fairly effective, wouldn’t you say? 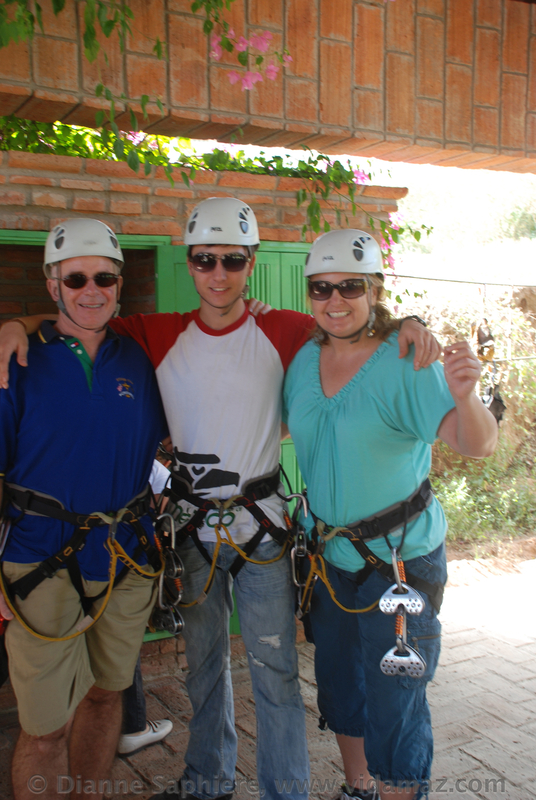 If you have family, family visits, or you just need some fun, adrenaline-raising activity, I definitely recommend zip lining! As we went through the course today, the staff kept telling us they had a surprise for us at the end. Danny knew, because he has learned how to rappel. 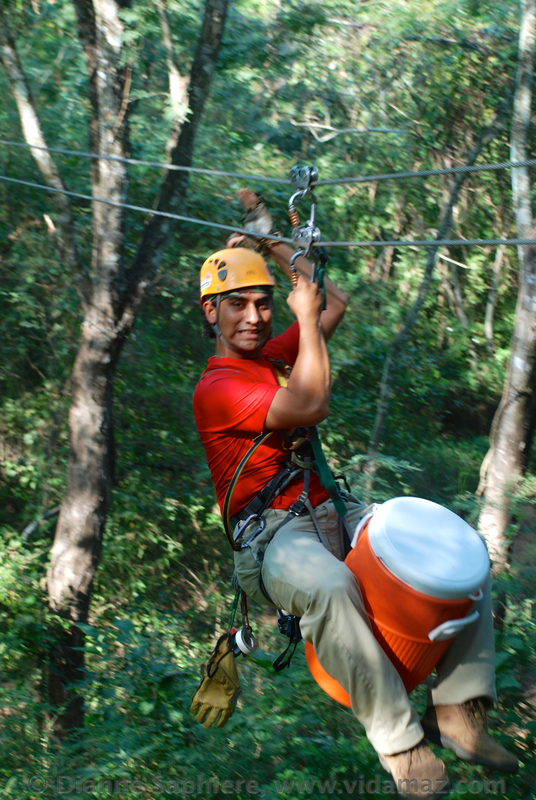 He saw the little gizmo on our belts, and guessed that at the end we would be rappelling. What they did was have us jump out, off the final platform, and then free fall (with a gentle pre-ground slowing) to the ground. It was very, very cool. Here’s video of Greg doing his dismount.